Marchionne: "Given the parameters of this industry, FCA is well-positioned to be a top performer, and that's all I care about." Fiat Chrysler Automobiles reiterated its plan to be in a net cash position by midyear and hit aggressive financial targets for 2018 set four years ago -- including nearly $10.9 billion of adjusted earnings before interest and taxes -- as the automaker prepares to transition to a new leader with the coming retirement of CEO Sergio Marchionne. And in comments to analysts, Marchionne said there is a "strong likelihood" FCA will outperform Ford in 2018." FCA said Thursday its fourth-quarter earnings before interest and taxes rose 22 percent to more than $2.37 billion. Net profit nearly doubled to $1 billion. Total revenue in the quarter fell 3 percent to $36.11 billion. Improving margins in North America -- which rose half a percentage point to 7.9 percent -- will mean $5,500 profit-sharing checks on average for UAW members, up from $5,000 a year earlier, FCA said. These payouts will be on top of a $2,000 bonus paid to all U.S. workers, except top executives, related to U.S. corporate tax cuts. Changes in U.S. tax law are projected to save the company $1 billion a year. Shares in FCA rose 0.75 percent to close at $24.32 on Thursday. In comments to analysts, Marchionne said the automaker would lay out its 2018-22 business plan for analysts at an event June 1 in Balocco, Italy, but would not name his successor until after that event. Marchionne plans to retire early next year after seeing the business plan through 2018 to completion. The CEO, who has run Fiat since 2004, has said his successor will come from the ranks of the automaker's global executive council. Despite plans to keep the previous-generation Ram 1500 pickup in production for at least a year to answer demand from commercial fleet customers, the CEO said he was "not interested in starting a share war in the United States" with Ford or General Motors in the pickup segment. 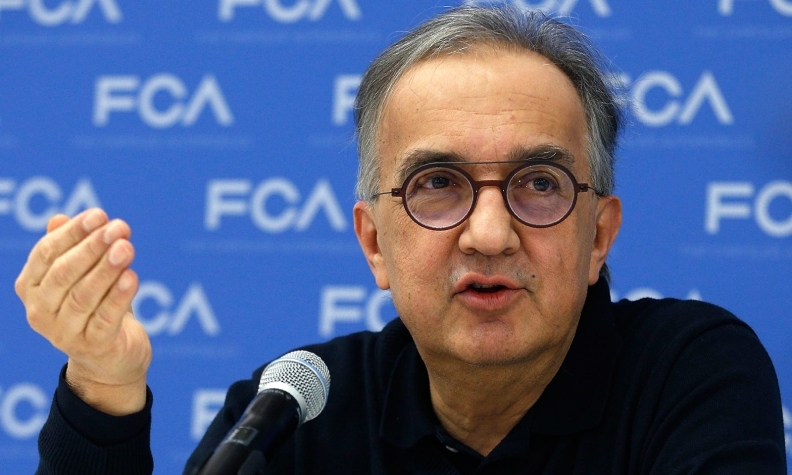 "That's not the objective," Marchionne said. While the company will be well short of the 7 million vehicles it projected in 2014 to sell in 2018, the financial targets will be achievable because of unforeseen levels of profitability from Maserati, Jeep and Ram. But, Marchionne warned, much of 2018's performance rests on properly executing the launches of the redesigned Ram 1500 and Jeep Wrangler. "I think the biggest risk ... is that we screw up all those launches and we can't deliver the volumes. That's the real issue -- that we can't make it." Additional manufacturing capacity brought about because of its reindustrialization plan in North America could mean as many as 50,000 additional Ram 1500 pickups and 60,000 Wranglers annually on an ongoing basis, once those recently launched products are fully ramped up. Marchionne said the additional Wrangler capacity would allow FCA to export the vehicle in greater numbers instead of limiting that global distribution to satisfy demand in North America. Both Fiat's and Chrysler's previous dire financial straits embedded fiscal discipline deep into the DNA of the automaker's top management. That should prevent it from spending wildly when times are good. "One of the things that came along with being poor ... is that you learn how to do with less. I have not forgotten, and no one on the leadership team has forgotten, what it was like." Alfa Romeo will again not be profitable in 2018, but it will return to Formula One racing after his retirement as the resurrected brand continues to grow beyond beyond its current lineup. "We're still building the brand, but we need more volume."